Coming from the guy who wrote the screenplay for Moonstruck, it’s not surprising that John Patrick Shanley’s Outside Mullingar is a beguiling romantic comedy that has just as much bite as it does heart. Anthony (Brian F. O’Byrne) and Rosemary (Debra Messing) live on two neighboring farms just outside of the Irish country town of Mullingar. He’s painfully shy and she’s hard as tacks – and then there’s the issue of their families’ squabbles over real estate. Still, there’s undoubtedly something going on under the surface between the two, but just what is it? 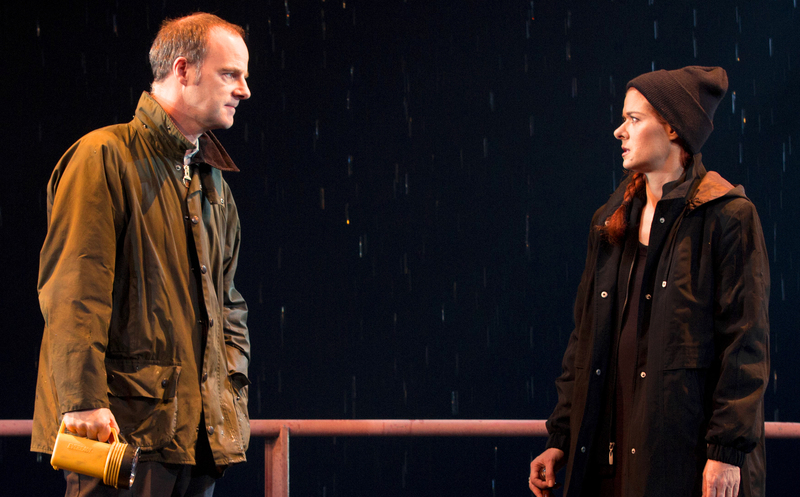 Shanley’s a savvy enough playwright to make the play about more than just these two. Peter Maloney is terrific as Anthony’s crusty father Tony, who’s perhaps overly cautious about the idea of leaving Anthony the farm (or is he?). The play is almost as much about their relationship as it is about Rosemary, and the father’s last scene with his son is as touching as anything else in the entire play. Messing, bravely and mostly successfully attempting an Irish accent, displays all kinds of colors and tones, nicely filling out the emotional life of this tough lady. O’Byrne – who unsurprisingly has the accent down cold – beautifully underplays Anthony’s eccentricity throughout. Director Doug Hughes, who also helmed Shanley’s austerely serious Doubt, underlines this play’s comedy without overwhelming its serious themes and gentle flavor. It’s definitely not the “big idea” play that Doubt is, but Outside Mullingar is charming without being truly fluffy. In true Irish fashion, despair and difficulty are somehow rendered beautiful and even enticing. Recommended. This is going to be some kind of hit – it’s about a week too soon to say whether it’s a “smash” or a “sleeper.” But I predict Beautiful will be at the Stephen Sondheim for a long, long time. And I couldn’t be happier about it! First of all, Beautiful features an extraordinarily sensitive, Tony-nom-worthy performance from Jesse Meuller as legendary singer-songwriter Carole King. King is most famous for her album Tapestry, one of the best-selling albums of all-time, with over 25 million copies sold worldwide. It still holds the record for most consecutive weeks at number 1 by a female solo artist. By the time she released Tapestry, however, King had already had a successful decade-long career writing hits for the biggest acts in rock ‘n’ roll, mostly in tandem with her then-husband Gerry Goffin. The story of their troubled marriage forms the heart of Beautiful, giving it a more human-scale feeling than any other jukebox musical I can think of, to terrific effect. Which isn’t to say that Beautiful lacks spectacle! Several production numbers feature breathlessly energetic “stage” performances of soul groups, such as the Shirelles and the Drifters, of those great 1960s Goffin/King classics. Director Marc Bruni manages the shifts from living rooms to concert halls with great deftness, including skillful use of Derek McLane’s multilevel set. For the production numbers McLane has created gorgeous, massive panels of lights that not only underline the song’s flavor but also open them up to something more abstract and magical. Truly beautiful! Mueller delivers her songs with nuanced feeling, and gives us an astonishingly three-dimensional portrait of a woman simultaneously living her dream and losing control of her life. The broodingly handsome Jake Epstein makes a great foil for her, showing Goffin slowly sliding into what we would recognize today as bipolar disorder. Anika Larsen and Jarrod Spector are great fun as the troubled couple’s closest friends – and songwriting competitors – Cynthia Weil and Barry Mann. Jeb Brown makes for a very engaging version of record executive Donny Kirshner – maybe a little too engaging, given Kirshner’s reputation for being stiff and a little wooden. 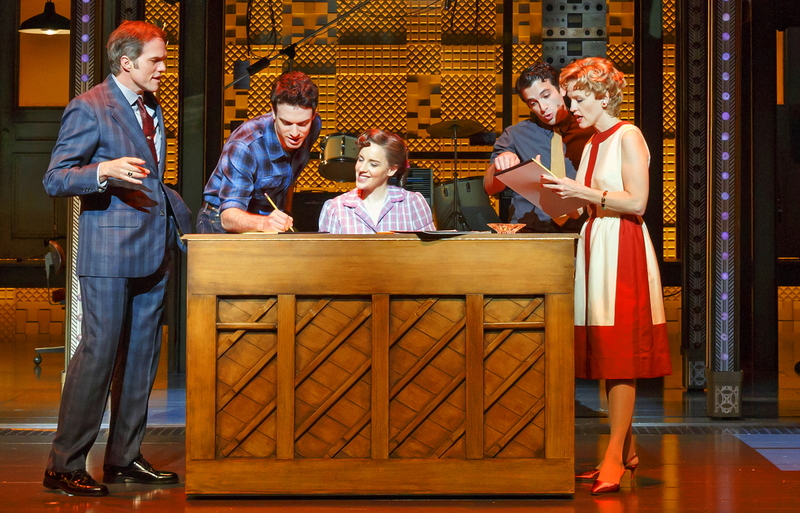 Beautiful is a jukebox musical with a recognizable human center. As such, I think it’s one of my favorite jukebox musicals of all time. Highly recommended. This vivid production of Sophie Treadwell’s remarkable 1928 play will no doubt get Tony nods for its breathtaking design. Set designer Es Devlin takes very seriously the brutally mechanical expressionism that surges throughout Treadwell’s text. Devlin gives us an imposing mechanical box which we first see as an unnervingly shuddering subway car, but which then ominously rotates to reveal all of the other settings in the play. Lighting designer Jane Cox takes things further still, showing us a New York lit by forbidding sparks of electricity. Shadows and light pay no attention to our expectations, highlighting devices and body parts almost at random. The design team follows Treadwell’s writing scrupulously, creating seriously unsettling transitions, but then favoring a warmer naturalism in Machinal‘s more subdued and humane scenes. 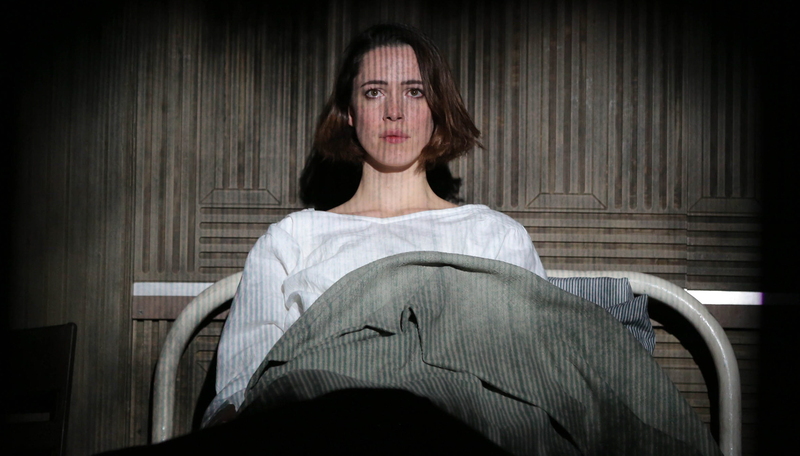 Inspired by the 1927 murder trial of one Ruth Snyder, Machinal follows a nameless Young Woman (Rebecca Hall), an alienated and neurotic person in an acceleratingly mechanistic world. The play takes a proto-feminist look at the dangers that come from treating people, especially women, as mere cogs in a machine. Director Lyndsey Turner has calibrated this production with unsparing attention to detail, making sure we always feel for the Young Woman’s predicaments as she veers into desperation and close to madness. Hall is very helpful on this front, portraying an immensely sympathetic woman who unquestionably doesn’t deserve the hand that life has dealt her. Machinal, especially as directed by Turner, is a totally compelling evening of theatre that leaves an audience with a great deal to chew on. Is it a masterpiece? Certain gaps in storytelling and the occasionally forced quality of the expressionism keep it from that august realm. It is undoubtedly, though, a thoughtful and important play that still speaks to us in an immediate and vital way. And that’s plenty! I found the current Met revival of Donizetti’s L’Elisir d’Amore an entirely pleasant bit of fun. It is probably the most popular example of bel canto, the light, florid style of early 19th Century Italian opera. In it, poor peasant Nemorino is in love with beautiful landowner Adina, who torments him with her indifference. Travelling quack doctor Dulcamara arrives on the scene, and Nemorino asks Dulcamara if he has a love potion. Dulcamara happily sells Nemorino a bottle (really just cheap Bordeaux wine, he admits in an aside). Director Bartlett Sher soft-sells the comedy in this production, emphasizing instead the pastoral and romantic elements with leisurely physicality and earthy coloring. He also works in subtle hints of the social unrest that Italy felt the whole century as it struggled toward unification and independence. 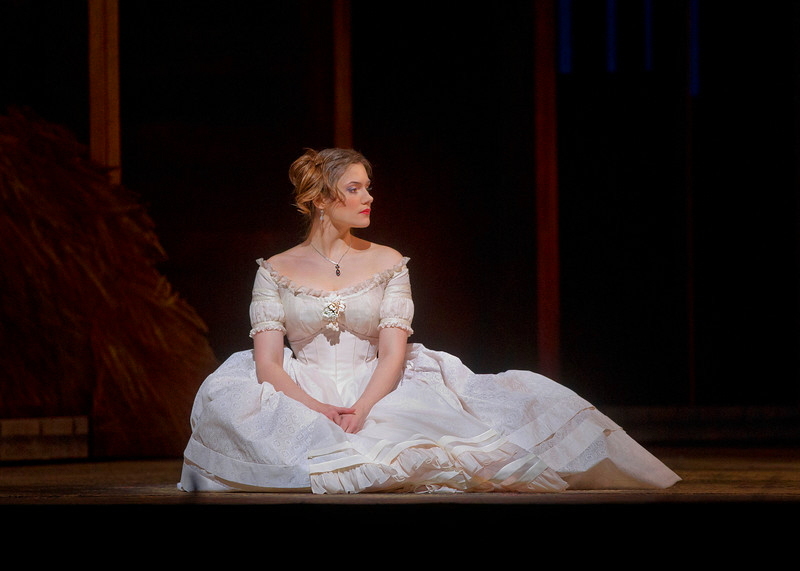 Soprano Andriana Chuchman makes a charming Met debut as the lovely and flighty Adina. Tenor Ramón Vargas gives a full throated, expressive performance as the love-struck Nemorino. My personal favorite, though, is Erwin Schrott’s eccentric and compellingly comic performance as Dulcamara, playing him as a bit of a dandy and peacock, which totally works for this persuasive mountebank. If I am less than over the moon about this L’Elisir, it’s probably more due to bel canto not really being my thing than to any innate flaws. I like the more satirical operettas of Gilbert & Sullivan for comedy, and in general prefer opera with more edge than L’Elisir possesses. It’s perfectly fine, just finally a little too frothy for me.